Which Rangers are primed for a breakout season? Chris Kreider and Derek Stepan are just two of the young players in the Rangers roster. But which one will have a breakout season? Photo courtesy of Getty Images. Although many fans of rival teams will say that the Rangers’ roster is full of aging players and no youth, that statement is totally false. In fact, the Rangers went from having a very thin farm system, to being loaded with goaltending talent, and having guys like Anthony Duclair, Brady Skjei and Pavel Buchnevich suddenly become well known prospects. On top of that, the lineup for next season should be mostly fueled by youth, especially with the forwards. Young players like Chris Kreider, Jesper Fast and Kevin Hayes populate the four forward lines, with tons of potential amongst all of them. Realistically, many of the Rangers young players can all have breakout seasons. Most of them have gotten invaluable experience during the team’s lengthy playoff runs, and for players like Emerson Etem and Oscar Lindberg, who are just joining the big club, there is no shortage of skilled players in the lineup for them to link up with. A lot of the team’s success next season does depend on the production of their youth. With a lot of money invested on defense and in net, and big contracts handed out to star players like Rick Nash and Derek Stepan, Alain Vigneault and the team need big production from the small contract guys, as well as the other young players in the lineup. These are the Rangers who are most likely to have a big season in 2015-16. Kreider is probably the choice that everyone is making for this upcoming season. In each of the past two years, we’ve seen him set new career highs in goals and assists, becoming a better, more dangerous player with each passing game. However, one thing has been missing when it comes to Kreider. He lacks consistency. During some games, and certain shifts, he will get out on the ice and absolutely dominate in the offensive zone. He’ll blow past defenders with his speed, attack the net with his size, and nobody can stop him. When he’s at his best, he may be the best power forward in the NHL. But then there are games or shifts where you can hardly find him on the ice. He’s not effectively using his strengths, and he isn’t benefitting the team by being on the ice. Kreider admitted that consistency is something that he needs to work on, and he’s taking steps to address that this offseason. You can read about that HERE. 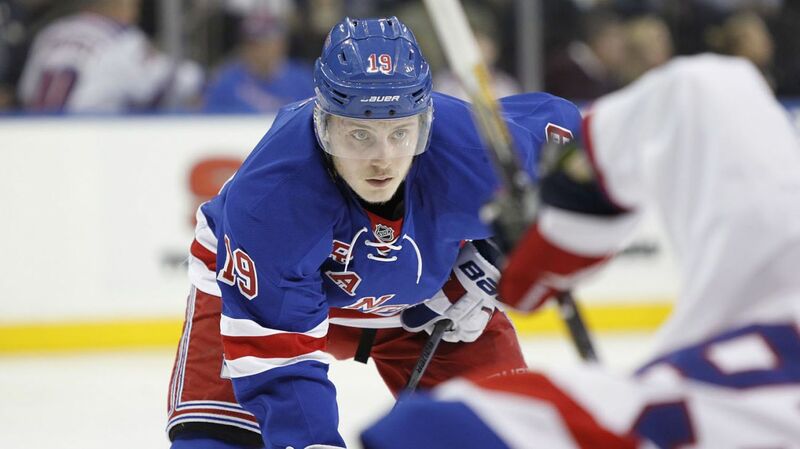 Simply put, Kreider may be the Ranger with the most upside. His skills are undeniable, he’s got quite a good wrist shot, and his hands are like no other. Before every game during warmups, you can see him working on deflections and redirections, and he’s got very quick reactions in front of the net when deking out goalies. This may be one of his most impressive goals, bursting past the defenseman with his speed, using his size to hold him off, and sending an incredible backhanded shot past Holtby. Kreider will definitely be paired with Stepan this year, who is also getting better and better with each passing season. On the right wing could be either JT Miller or Jesper Fast, the two most likely candidates. JT Miller spent time there during both the regular season and during the playoffs, and the “All-American” line performed very well. When Jesper Fast joined the second line against the Capitals, they were unstoppable, creating tons of chances and scoring lots of goals. 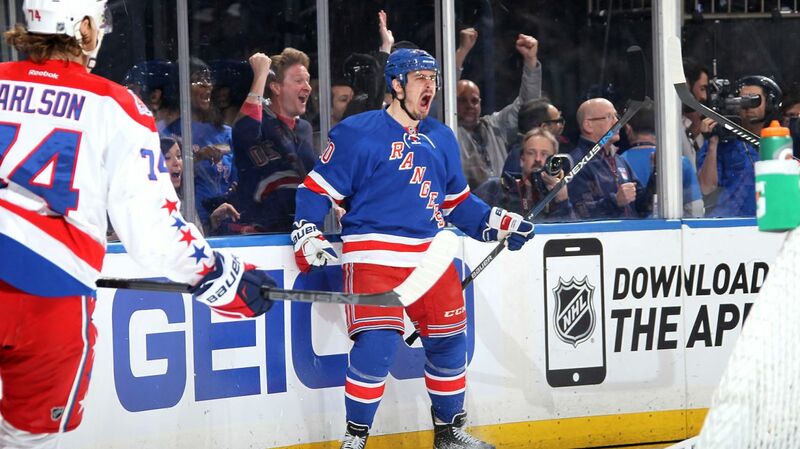 Chris Kreider scored 21 goals this past season, his first ever 20 goal season in the NHL. There is no doubt in my mind that he will be a 30 goal scorer in this league one day, and that could happen as soon as next season. Photo courtesy of Jeff Gross/Getty Images. When the Rangers traded Carl Hagelin, a fan favorite and a very reliable winger, they made sure to get a worthwhile return. On top of moving up in the draft to select Ryan Gropp, they obtained the rights to restricted free agent Emerson Etem, whom they have since signed to a one year, $850,500 deal for the upcoming season. 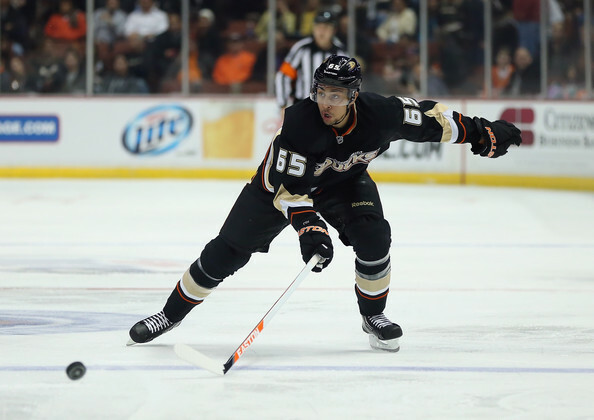 A former first round draft pick of the Anaheim Ducks, born and raised in California, Etem was an extremely talented player in junior hockey, and a scoring machine. In his final season with the Medicine Hat Tigers, Etem tallied an incredible 61 goal, 46 assist season in just 65 games. Despite his proven track record in juniors, the Ducks never really gave him a fair shot at being a top-nine or top-sox player. Etem spent the majority of his NHL games on the fourth line, paired with slower, less skilled players that could not complement his abilities, and limited his efficiency on the ice. He never played more than 45 games with the Ducks in a single season, and bounced between the NHL and their AHL affiliate in Norfolk. When in the AHL, Etem continued to score at a frenzied pace against pretty solid competition. In his last 72 games with Norfolk, he’s totaled 75 points (37-38-75). His situation is very similar to that of JT Miller. For a few years, Miller bounced between the NHL and AHL, never finding a consistent spot in the lineup, and usually being relegated to the fourth line. In 114 games, Miller has a total of 33 points (15-18-33), 23 of those points coming this season. For Etem, he has 31 points (15-16-31) in 112 games. Eerily similar results in near identical situations. We saw JT Miller improve when given time as a top-nine player, and I think we will see the same with Etem this season. Jeff Gorton has already made it known that Etem will get every opportunity to solidify himself as a top-nine player, and the Rangers need him to return to his junior hockey scoring roots. Etem is another player with speed, and he’s also a bigger forward; not too different from Chris Kreider. He does have an immense amount of skill and promise. I’m sure you’ve all seen this goal by now, but here it is again. I see Etem at least doubling his career high point total of 11 points (7-4-11). He’s not going to be wasting away on the bottom line anymore. He’ll be expected to be a contributor on the third line, probably playing with a very skillful Kevin Hayes. He kills penalties, has good speed and size, and there is a scorer somewhere inside him. Alain Vigneault just needs to help him find it. If you want to read a more in depth profiling of Emerson Etem, check out this article I wrote about him after the trade. Jesper Fast is one of the more intriguing prospects that the Rangers have on their team. After playing a handful of games with the team last season, Fast made the team out of training camp, was sent back down to Hartford but quickly recalled. Soon after that, he was a mainstay in the lineup. Fast, 23, was selected in the sixth round of the 2010 NHL entry draft, coming out of Sweden. He played a few season in the Swedish League before making his way to the AHL. He improved by leaps and bounds this season, growing into a solid player under the guidance of Alain Vigneault and the rest of the coaching staff. In my opinion, his best skill is his defensive play, and his positioning away from the puck. Fast was a very important member of the team’s penalty kill, where he was not on the ice for many power play goals against. He’s got an active stick, and makes a lot of interceptions and deflects a lot of shots and passes. That area of his game is very good already. But according to Fast, his goal for the upcoming season is to play more, and to score more, according to Hockey Sverige. For most of the season, Fast mainly played a fourth line role, mainly due to his defensive ability, and his speed which complemented Dominic Moore nicely. But when injuries occurred, and Vigneault wanted to shake up the lines, Fast was usually one of the guys bumped up. Although he finished with just 14 points (6-8-14) in 58 regular season games, Fast showed signs of offensive brilliance. He’s pretty quick, stronger than his size suggests, and he’s scored some great goals. This spinning goal against the Carolina Hurricanes is just a glimpse of what he can really do. In the playoffs, Vigneault decided to use Fast on the second line with Chris Kreider and Derek Stepan, starting against the Washington Capitals. Something clicked, and this trio became the best line for the Rangers in that series. Fast was a big part of the line’s success too, and he meshed really well with them. He was crucial in the series winning goal, helping win back a faceoff to Keith Yandle, setting up the goal. I think we could also see Fast potentially double his point total from this past season. I predicted that he would start on the fourth line with Dominic Moore and Oscar Lindberg, both skilled players that know how to score. I think it would be a very effective fourth line, but we could see a lot change amongst the right wingers. Fast could see time on the second and third line, and I think he’ll build on his offensive skill set for this upcoming season. While it seems like Derek Stepan has been here forever, he is still just 25 years old. The former University of Wisconsin standout missed 14 games to start the season due to a broken leg, but when he came back, the team was immediately impacted by his play. It seemed as if he was tallying a point a night, whether it was on an assist or by firing a puck into the back of the net. The team immediately began playing better upon his return, and he helped right the ship, playing a big part of the streak that saw the Rangers win 13 out of 14 games. Despite playing in just 68 games this season, Stepan finished with 55 points, the second highest total of his career. His 39 assists were second on the team, and one shy of his career high set in 2013-14. If he played the full season, he definitely would have hit 60 points for the first time, and he may have had a chance to challenge Nash for the team lead in points. 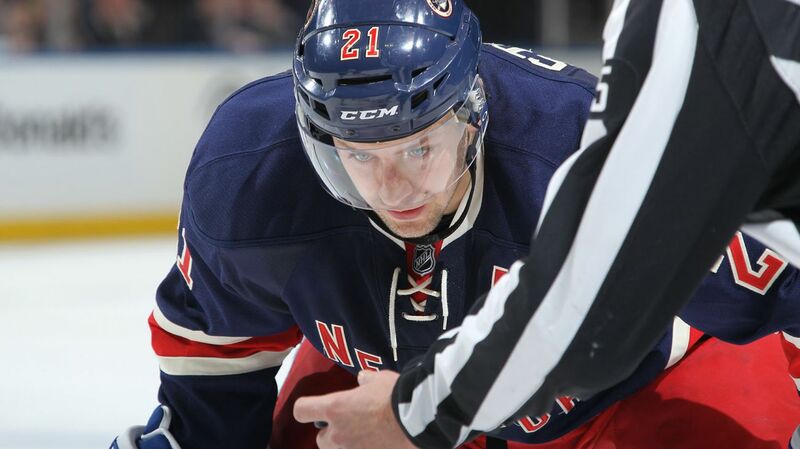 I think that if he improves his faceoffs, Stepan will be a Selke Trophy winner one year. He’s improving with every passing year. He has eyes in the back of his head, and incredible chemistry with Chris Kreider. 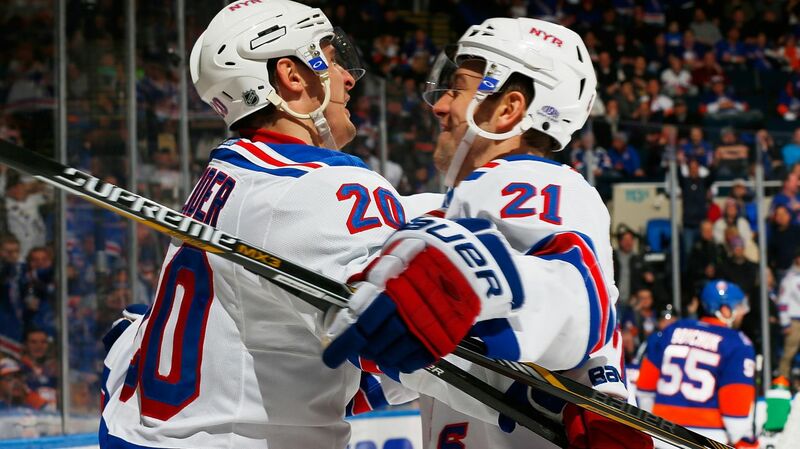 If Kreider has the big year that is expected of him, then Stepan will benefit and have a big year himself. With a new $6.5 million contract, he may be more motivated than ever to prove that he’s worth the contract. I say that he’ll definitely reach 60 points, with a chance at surpassing 70. Posted on August 5, 2015, in Uncategorized and tagged Chris Kreider, Derek Stepan, Emerson Etem, Etem Rangers, Jesper Fast, JT Miller, Kevin Hayes, Madison Square Garden, MSG, New York Rangers, New York Rangers blog, NYR, Oscar Lindberg, Rangers, Rangers blog, Rangers rookies. Bookmark the permalink. Leave a comment.